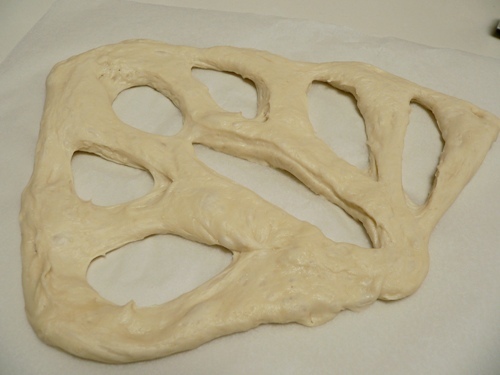 Fougasse was one of my earliest breads – the shape being the first one taught in Richard Bertinet’s Dough. It’s very quick to make with yeast, as it doesn’t require a second rise, although I’ve only had limited success making it with sourdough. Like many flatbreads, it seems to rely on the speed of bakers’ yeast to give it a quick spring in the oven. Begin with a batch of yeasted dough – if you need a recipe, I’ve written an indepth tutorial here. 1. Preheat oven to maximum. After the bulk prove (first rise), turn the dough onto an oiled surface, and divide it into two. Work each piece into a rough rectangle, then cut each piece into three smaller pieces (six pieces in total). 2. Lay each piece onto a sheet of parchment paper. With the edge of your dough scraper, or a serrated knife, cut through the dough with several straight incisions. Be as creative as you like, but try to make a few larger cuts rather than lots of small ones, as the latter will tend to close up on baking. 3. Now, here’s the trick – dust your fingers with a little flour, and get right in there and open up all the holes. Don’t be too gentle with it, really spread them out as shown below. These are now ready to bake and can be dusted with flour if you prefer. 4. Turn the oven down to 230C or 220C with fan, and bake the fougasse for 10 – 15 minutes, or until golden brown. I bake mine on pizza stones, carefully pulling out the parchment paper halfway through the baking time, but you could just as easily shape and bake them on lined trays. These are great fun to make, and particularly good for entertaining! Your Fougasse looks great & very pretty too! MMMMMMMMM,..It looks like you had fun making it! We have seen Fougasse in France (it officially comes from the southern Provence region) and yours looks delicious. Such fun with all those holes! I love breads with supper these warm summer months – well it’s warm here in the UK, anyway! Gorgeous! That looks like a bready-pretzel… two of my very favourite things. I love oddly shaped food! Those are exceptionally beautiful and look so delicious. I would love to try to make them! They make me smile just to look at them. I would love to have a tug of war with one. I would like to dip it into hummus or a cheesy dip and devour it whole> I think I’ll make them for a birthday treat! Beautiful bread and photos of it, Celia! Thanks for reminding me – I love fougasse, but haven’t made it in ages. i love fougasse! in fact, i just made a batch today, topped with caramelised onion, that’s my favorite variety. there was no light by the time i was done with all the chores, i hope it lives to see tomorrow so i can take a pic. you take very nice step-by-step photos, those are so helpful when you’ve never made something before. that snappy crust looks excellent. simply beautiful. I loved it…. Yum. What a great use for za’atar–love all the ingredients…Might have to whip some fougasse up..
Did you see my note at BabetteFeasts? I swear we were on each other’s blogs at the exact same moment leaving comments! Neat bit of serendipity…Just sayin. Oh Celia, you are a wonder. These look lovely. Think za’atar is going to be my next challenge, I keep hearing so many good things about it. I am a total bread making know nothing – I have never tried it as it seems like such an art that you must immerse yourself in (the closest I’ve come is putting a bread mix in my bread maker!). Your tutorials, photo’s, instructions and results are so tempting I can see that I might just think about immersing. Celia – thank you for the recipe. I have sumac and sesame, just need dried thyme – woopee, another interesting spice mix to try!